August has a rhythm all it’s own, especially in the South. These hot, humid days force us to slow down our pace a bit, and why not? The soil has been tilled. Gardens have been planted. Some vegetables have already been harvested and more are on the way. The only thing left to do is pray for rain and wait until everything is ripe and ready. In the meantime, we can escape the sweltering heat of the day by “sitting a spell” on the porch with friends, sipping glasses of sweet tea and eating a freshly baked peach cobbler! That’s how we roll in North Carolina and I wouldn’t have it any other way! The first of August is known by several names: 1) Lughnasadh, which is Gaelic for the modern Irish word “Lunasa,” meaning August. In ancient times the Sun God Lugh was honored. 2) Lammas is the English version of the same holiday. The word is Anglo-Saxon for “loaf mass” and was celebrated by Pagans and Christians alike. 3) Festival of Green Corn, which is the name Native Americans attach to this harvest festival, and 4) Feast of St. Peter in Chains, which is an odd ancient Christian observance that has been removed from the liturgical calendar. Basically, Lughnasadh is the first of three harvest Sabbats or festivals. This particular one celebrates the first fruits of corn, wheat and barley. Needless to say, this is something to be thankful for, especially in ancient times. A successful harvest meant there would be plenty of grain to last through the cold winter months. The main food for this festival is bread in one form or another. 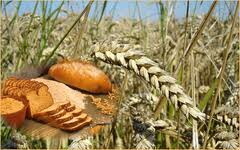 Bread has always been universally symbolic of life, Mother Earth, home, hearth, harvest and vitality. Because of this, ritual bread appears in every religious tradition I can think of. and against all the snares of the enemy. Amen. Some of the bread in the Christian tradition was used to celebrate the Eucharist (Holy Communion) on Lammas. The rest of it was blessed and taken home for the Lammas Day feast. I also discovered that in Anglo-Saxon England this blessed bread was used by some to work magic! According to a book of Anglo-Saxon charms, a Lammas loaf was broken into four bits, which were placed in the four corners of the barn in order to protect the gathered grain. In modern times, we can celebrate Lughnasadh/Lammas not only by giving thanks to the Divine for a successful harvest, it can also be a day to support local farmers. Let’s face it, they work their tails off to grow the food that appears on our tables. Perhaps we can use this holy day to commit ourselves to buying as much locally grown food as possible. I make a weekly trip to a tailgate market that is less than a mile from my house. It’s a wonderful opportunity for us urban dwellers to connect with our agrarian brothers and sisters. I always have wonderful conversations with the vendors there and I’ve learned a lot about how to cook the fruits and vegetables that are grown by them. As a final note, my Cherokee brothers and sisters still celebrate the Festival of Green Corn. There is always dancing, singing, drumming and the eating of corn in a number of forms. You can Google the topic for more information. So I wish everyone a most blessed Lughnasadh/Lammas celebration. If you’re ever in North Carolina I have a glass of sweet tea and a peach cobbler waiting for you! This entry was posted in Lughnasadh, Wheel of the Year and tagged Lammas, Loaf Mass, Lughnasadh. Bookmark the permalink.